For a limited time we are offering a FREE trial subscription. To get started, please click here! 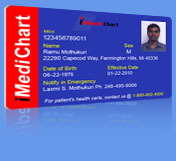 Subscribers get iMediChart.com Wallet size and Key chain "In Case of Emergency (ICE)" health cards that can be used by paramedics, ER responders, ER doctors, and Physicians to get emergency contact information and some vital medical information. Access your data in a matter of seconds by logging into our website. Update you information like Emergency contacts, Allergies, Doctor visits, Medical Histories, Procedures and more. If you are travelling, going on business trips, vacations or if your kids are going to out of town schools or colleges, iMediChart service could be extremely usefull. It will give you that peace of mind by assuring you that you are prepared for emergencies. Millions of people try to maintain their personal health records at home, but may not be accessible in case of emergency or regular doctor office visits. iMediChart membership can help you do that more efficiently with an online Personal Health Records (PHR) management system that has been designed and developed with a novice computer user in mind. Patient data can be securely accessed by the hospitals or healthcare providers remotely anytime. Patient personal data is stored on a secure server with state of the art firewalls and is treated as extremely confidential. Easy sign-up online @ www.iMediChart.com or by calling us 24 hours a day 7 days a week. Email notification sent to subscribers for additional security when their account is updated. For a limited time, subscribers can enjoy a FREE membership of iMediChart for a month.